In my previous article, I have documented the steps to back up the HP virtual Connect modules ( Flexfabrics). Please refer to this link for steps. In this article, I have documented steps to restore HP interconnect module. 4. After login, select “Domain Settings- Backup/Restore” in left side of the console. 6. 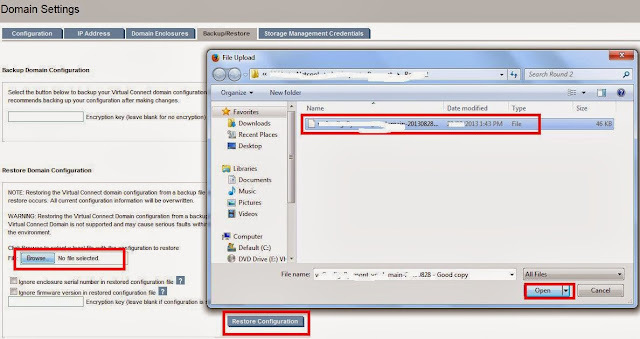 After the restore, log back to the Virtual Connect Manager after 2 minutes and make sure that required configuration is restored. I have performed following steps to check that my backup and restore process is working as expected. Please refer this link for the steps to backup HP VC throughGUI.